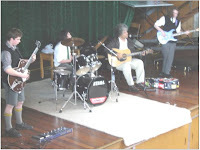 Wednesday’s assembly guest was musician Mr Paul Ubana Jones. Paul studied guitar and chello at the London School of Music before launching an international career with his distinctive Jazz – Blues style. Thank you to Mr Alan Dyer, a College parent, who organised for Paul to play to the school and then hold workshops for interested musicians.